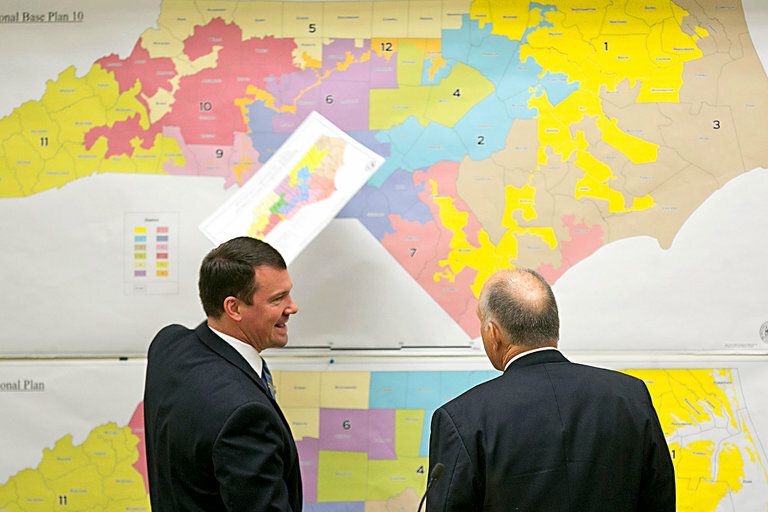 Republican State Senators Dan Soucek, left, and Brent Jackson review historic maps during a special legislative session in 2016 to set North Carolina’s 13 congressional districts. A panel of federal judges struck down North Carolina’s congressional map on Tuesday, condemning it as unconstitutional because Republicans had drawn the map seeking a political advantage. The ruling was the first time that a federal court had blocked a congressional map because of a partisan gerrymander, and it instantly endangered Republican seats in the coming elections. The unusually blunt decision by the panel could lend momentum to two other challenges on gerrymandering that are already before the Supreme Court — and that the North Carolina case could join if Republicans make good on their vow to appeal Tuesday’s ruling.In October, the court heard an appeal of another three-judge panel’s ruling that Republicans had unconstitutionally gerrymandered Wisconsin’s State Assembly in an attempt to relegate Democrats to a permanent minority. In the second case, the justices will hear arguments by Maryland Republicans that the Democratic-controlled Legislature redrew House districts to flip a Republican-held seat to Democratic control. The Supreme Court has struggled without success for decades to develop a legal standard for determining when a partisan gerrymander crosses constitutional lines. The court once came close to ruling that such cases were political matters beyond its jurisdiction. But the rise of extreme partisan gerrymanders in the last decade, powered by a growing ideological divide and powerful map-drawing software, has brought the question back to the justices with new urgency. A Supreme Court ruling outlawing at least some such gerrymanders could reshape the political landscape. Fights over voting rights and election procedures have often taken center stage in Raleigh, North Carolina’s capital, and Tuesday’s ruling noted that “partisan advantage” had been a criterion lawmakers used when mulling how to map the state. In a separate post on Twitter, Mr. Woodhouse argued that Judge Wynn had concluded that North Carolina’s Republicans “should not be allowed to draw election districts under any circumstances under any set of rules,” an effort he called “a hostile takeover” of the General Assembly and legislatures nationwide. Republicans could ask the Supreme Court to stay the decision and allow the disputed map to be used this year. But critics of the congressional map welcomed a decision that was notable for its tartness and urgency.“Clearly, the courts have realized that they do need to step in and police extreme partisan gerrymanders, and the court recognized that North Carolina’s gerrymander was one of the most extreme in history,” said Ruth Greenwood, senior legal counsel at the Campaign Legal Center and a lawyer representing some of the map’s challengers. The judges issued their decision fewer than 24 hours before the General Assembly was to convene in Raleigh for a special session. The ruling unmistakably placed lawmakers on the clock, giving them two weeks to present a “remedial plan” and declaring that the court would institute its own map if it finds the new district lines unsatisfactory. Professor Bitzer, though, cautioned that the ultimate political fallout would not become clearer until the courts settled what could be a cascade of appeals and injunctions. Most federal lawsuits are first heard by a district court, and later — if needed — by an appeals court and the Supreme Court. But under federal law, constitutional challenges to the apportionment of House districts or statewide legislative bodies are automatically heard by three-judge panels, and appeals are taken directly to the Supreme Court. In addition to Judge Wynn, an appointee of Mr. Obama’s, Senior Judge W. Earl Britt of the Federal District Court in Raleigh joined the opinion. Judge Britt was appointed by President Jimmy Carter. Judge William L. Osteen Jr., who was appointed by President George W. Bush and sits on the federal bench in Greensboro, said he agreed that the existing map violated the 14th Amendment, but he disputed other parts of Judge Wynn’s opinion, including the decision to appoint an independent expert to begin preparing an alternative map.